Portable Knife Sharpeners: Everything You Should Consider Before Buying One! Home General Portable Knife Sharpeners: Everything You Should Consider Before Buying One! Yea It’s Portable, But Does It Actually Work!? Portable knife sharpeners are awesome! They come in all shapes, sizes, designs, and for the most part they’re extremely easy to use. While I can’t stop raving about them, the unfortunate truth is that many are actually quite terrible when it comes to functionality. Sure it looks cute and doesn’t cost much, but instead of sharpening my knife, it dulls and scratches it! The point I am trying to make is this: Don’t just buy something because it’s portable, nice to look at, easy to store, and cheap. Functionality should trump all of these when making the decision. I know, it sounds silly and obvious right! I mean, why would anyone buy anything that doesn’t work as intended? Well, you’d be surprised. Having said that, the purpose of this post is to give you a couple of things to think about before buying a portable knife sharpener. By the end, you should be able to make a decision that best meets your needs. I will also share, what I think are 2 really good portable knife sharpeners. Keep reading! 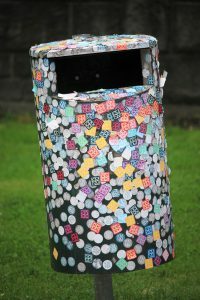 Just Because It’s Cute & Pretty, Doesn’t Change The Fact That It’s Trash! Size can be subjective. What I consider portable, isn’t necessarily what someone else will. Allow me to further elaborate. A portable knife sharpener for me is one that is small enough such that it can be stored in my kitchen drawer without taking up much space. On the contrary, portable for Connor, my buddy who hikes and camps, is something that is small enough to throw in his jacket pocket. The question is: what does portable mean to you? To answer this question, you should think about where and how you wish to use the sharpener. Maybe hiking, fishing, camping or some other outdoor activity? Or maybe you would like to always have it present in your car’s glove compartment? Once you have a clear understanding, you should pay special attention to the dimensions when considering any portable knife sharpeners. Use this as a criterion to qualify or disqualify a device. Don’t take this for granted, and actually spend some time thinking about it! 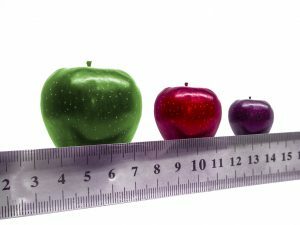 Size Can Be Subjective: What’s Small To Me, May Not Be Small To You! There are only a handful of “portable” electric sharpeners currently in the market. For what it’s worth, I’d recommend you avoid electric devices altogether. And the reason I say this is because I think it’s an inconvenience to find a power supply every time you need to sharpen. To me, it adds an extra layer of complexity that I could do without when I’m on the go. But that’s just me; everyone is different. What about you? Would you prefer an electric or non-electric portable solution? Think about it. #3 How Easy Is It To Use? Now, I did mention earlier that most portable knife sharpeners are quite easy to operate. But here’s the thing: easy to operate at home on a completely flat surface is not the same as easy to operate out in the bush, wild, or in a fishing boat. Indeed, desperate times call for desperate measures! You need to find a device that will be most easiest to operate for your specific situation, not someone else’s. If you’re unsure about what your specific situation is, then this is where you need to focus on. And it could be anything really. I know someone who wanted a portable knife sharpener to carry with her when over preparing meals at her friend’s place. Because of her specific situation, she had the freedom to choose from a number of different devices. Not everyone will share the same freedom because not everyone has the same situation. Watch videos demonstrating the sharpener in action, and ask yourself the question: will this be easy and work well for what I specifically need it for? Just like size, use this as a criterion to qualify or disqualify the portable knife sharpeners you may be considering. Cost and warranty needs to be considered for pretty much anything you buy. I’d pay special attention to warranty if I were you. And that’s because portable knife sharpeners typically take quite the beating (in most cases). It’s likely you’ll carry it on the go, and depending on where you use it, you may subject it to rain, heat, and extreme cold even. These adverse conditions can damage the abrasive thereby rendering the sharpener useless. Having said that, it’s important you understand the warranty coverage and conditions. Will the manufacturer repair or replace? 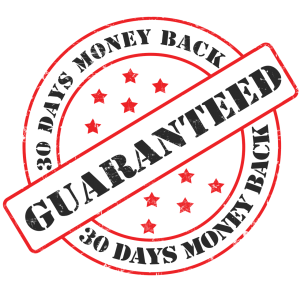 Is there any costs you will need to incur when sending a defective product back? Again, this is basically just the usual homework you should do before buying anything. You Should Pay Special Attention To Warranty! #5 Compatibility: Will It Sharpen Your Knives? This is a very important consideration. There’s no point buying something, if it doesn’t serve you. For example, if you own a serrated style blade, then it makes no sense buying a portable pull through sharpener. Pull through’s are not meant to be used to sharpen serrations; instead, you should consider looking for a serrated sharpener (sharpening rod). It’s important that you check compatibility between the sharpener and your knives, before buying. You should be able to verify this pretty easily, as this information is readily available in the product technical description. My 2 Favorite Portable Knife Sharpeners! To conclude this post, I would like to provide 2 recommendations. Not only are these 2 devices highly effective, but they won’t leave a hole in your pocket either. Everyone has favorites, these are mine! I Can Put It In My Pocket: Yes, small enough to fit in my jean or trouser pockets. Because of this, I can carry it around pretty much anywhere I go! I Can Use It On My Serrated Knives: Not only does it have ceramic and carbide pull through slots, but it also features a mini sharpening rod to work on serrations. Out of everything, this is probably what I love most! They Cover Me For Life: Heck yes for lifetime warranty! Yes, it’s true you’re covered for life should the device malfunction. Stupidly Easy To Use: Ease of use becomes a lot more important when you’re on the go, and this does not disappoint. 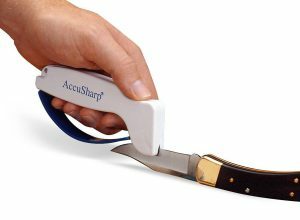 Its “swipe through” motion makes sharpening a breeze. It’s quick, easy, and effective. Easy Peasy: Swipe From Heel To Tip, And Voila! I hope this post has given you some value, and if it has a share would be appreciated. 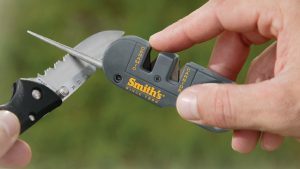 What are your favorite portable knife sharpeners? I’d love to hear! Leave me a comment and let me know if you have any questions. Have a great week ahead!